I knew three Black men who died in the last four years in San Francisco. The story of their passing tells us much about the ongoing transformation of San Francisco into a haven for the white and the privileged. 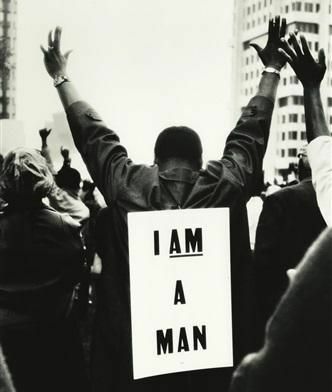 Dispense with any stereotypes about Black men being shot down by the police or dying from some kind of street violence. All three of these men were in their sixties, had lived in San Francisco for decades, and had achieved some form of economic stability, if not prosperity. All of them had engaging, sociable personalities that drew people to them, and were surrounded by many friends. I met Mark when he was a waiter at the St. Francis Hotel, in the 70s. By all accounts, including his own, he was a lousy waiter. But he was a strong supporter and comrade of the workers at the hotel, especially the room cleaners, who were leading the fight for respect and dignity on the job, at a time when the hotel and restaurant workers union, Local 2, was in turmoil. Mark participated in the epic month-long citywide 1980 hotel strike, and in the struggle for democracy in our Union that was part and parcel of that fight. In 1984, when my wife and I moved out of our rent-controlled one-bedroom apartment on Guerrero Street, where we had been paying $300 a month in rent, Mark moved in, and lived out his life there. Mark eventually got a job as a Muni supervisor, and worked for Muni until he retired, with a City pension. 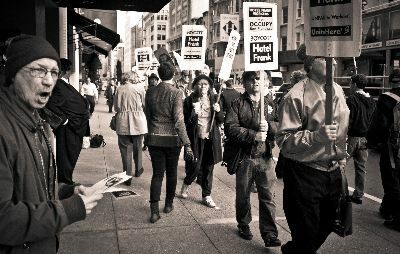 A few years ago, when I was embroiled in battle with Hotel Frank (a boutique hotel right next door to the now "Westin" St. Francis), Mark was a regular on our picket line, never wavering from his lifelong solidarity with San Francisco's working class. Mark passed away suddenly and unexpectedly in the middle of one night in 2015. We held a well-attended memorial for him at Atchison Village in Richmond, where he had been intending to move with his partner, a server at the St. Francis. Mark had a roommate at his Guerrero Street apartment. Mark also had a greedy landlord. When he passed, that landlord took advantage of a loophole in our rent-control laws, and raised the rent from a few hundred dollars to $3,000. Mark's roommate couldn't afford that, and was forced to move out of the City. I don't know who is living in that apartment now, or how much he or she is paying in rent, but I imagine it is some well-heeled techie, glad to live steps away from yuppified Valencia Street, and not likely to spend much time on picket lines like Mark did. One Black man down and gone from San Francisco. Jimmy (not his real name) came to San Francisco from Texas (not the real state). He worked for decades as a service technician for a utility company. Like Mark, he was able to live, work and retire comfortably. Jimmy bought a condo in the Bayview, where he served honorably for many years as a Home Owners Association (HOA) officer, while also performing many maintenance tasks in the building. He lived alone, but had many friends, was the captain of his bowling league team, and enjoyed the local card tables. In his latter years, he was self-employed, largely installing water heaters for elderly Black folks in the Bayview, a population that is rapidly dying out. But then dementia set in. Jimmy became increasingly unable to take care of himself. His daughter came out from Arkansas, stayed with him a while, but then left without putting any kind of support services in place. Predictably, his condition deteriorated. When he went missing in action for a few days, a friend called Adult Protective Services, and Jimmy was found in bed, emaciated, and in need of help. He was hospitalized at SF General (before it was Zuckerbergized). His dementia seemed irreversible, but this was a man who had a place to live and a decent pension income. What he needed was caregiver support to maintain him in his own home, among his friends, something that he would have wanted and that you would think the San Francisco social service system should have been able to facilitate. That was not to be. Instead, Jimmy's daughter reappeared and offered to take him off San Francisco's hands. She had already demonstrated a complete lack of commitment to his welfare by leaving him in the lurch earlier. The doctors and social workers at SF General were apprised of this fact, but they didn't care. The easy thing was to let his daughter take this Black man off their hands. So she was allowed to whisk him off to Arkansas. She took away his cell phone, which prevented him from communicating with his friends here in the City, and then sent him to some unknown institution. Not long after that, he was dead. Meanwhile, Jimmy's daughter sold his condo for several hundred thousand dollars. It is now owned by an absentee landlord, and has been inhabited by a string of young hipsters paying mucho thousands in rent. There is no rent control on condos. Another Black man down and gone from San Francisco. Billy (not his real name) came to San Francisco many years ago from Georgia (not the real state). He was a Gay man, happy to be in San Francisco. He lived here through the AIDS epidemic, partied with many friends, but was careful to stay HIV-free. He worked a string of jobs, including acting with the Lorraine Hansberry Theatre and other theaters, as a travel agent in the pre-internet age, and even as a flight attendant for a while. I occasionally ran into him when he worked odd jobs at the Moscone Convention Center. He was never all that economically secure, but he had a rent-controlled apartment in the Mission since the 70s, not far from where Mark lived, and that enabled him to stay in the City. He was known by many for the well-attended Halloween parties he threw at his apartment. Then Billy found out he had cancer. He had medical insurance, but ran into a string of doctors and medical institutions that failed him in ways that are a story in itself, and won't be told here. Billy knew he wasn't being treated right, but when questioned about what was going on, just answered, "You know I'm Black, right?" One day his roommate found him passed out on the kitchen floor. He was taken to the intensive care unit (ICU) at the now Zuckerbergized SF General Hospital. The doctors and nurses in ICU did yeoman's work and got him back to a semblance of stability. But when he was transferred to the general ward he was the victim of neglect and ended up right back in ICU, where he passed away several days later. Yet another Black man down and gone from San Francisco. It is unclear at this point what will happen to Billy's apartment. His roommate has a battle on his hands to stay there, much less to hold on at rent-controlled rates. However that fight turns out, we all know what the trends are in this City by the Bay. The Black population is down to something like 5%. I work at the ballpark, where there are still a lot of Black workers, but my worksite is the exception, not the rule, and many of these Black workers commute from the other side of the Bay. Gentrification is marching down Third Street, past the Giant's renamed Oracle Park, past the new Chase Stadium for the Warriors, past the formerly industrial and working class Dogpatch, following Muni's T Line all the way to Visitacion Valley. Even the Black-owned Bryant Mortuary has gone out of business. San Francisco's young and new Black Mayor, London Breed, is probably the City's last chance to reverse this trend, if there is a chance. We will see what she can do. But it is too late for Mark, for Jimmy, and for Billy. They are gone, and it ain't Black folks who have taken their place. One of the sad parts of growing old is watching your friends die. Are there any villains in this story? Maybe so, maybe not. At root, however, this is just a story about how the system we live in works, putting profit and greed before people. There is a hand-written sticker on my front door that was handed to me in passing one day. It reads, "The system is utterly rotten. It must be OVERTHROWN. Ripped Up. Thrown Out." Those words seem truer with every passing day. Mark Davis on the Hotel Frank picketline.